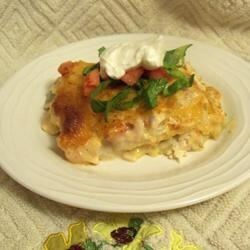 "A spicy, savory baked chicken treat. Food fit for kings!" Combine the chicken soup, mushroom soup, broth and tomatoes with chiles. Set aside. Lightly grease a shallow 3 quart casserole dish. Layer 1/2 the tortillas, 1/2 the chicken, 1/2 the onion, 1/2 the bell pepper and 1/2 the cheese in the casserole dish. Pour 1/2 of the soup mixture over the layers. Repeat the layers of tortillas, chicken, onion and bell pepper; pour the remaining soup mixture over the top, then top with the remaining cheese. Sprinkle with chili powder and garlic salt and bake for 30 to 45 minutes. Folowed advice of other reviewers and only used on e cup of broth. This as a good recipe but we did not like the corn tortillas. Wil def try again Maybe use flour tortillas? The sauce was great! I prefer to leave out the broth, use 3 cups of cheddar, and add about 1/4 cup coursely chopped cilantro, and 1 large chopped fresh jalapeno. Delicious! Easy and satisfying. A keeper!